How often have you caught yourself reaching out for your phone to make quick online banking transactions and check your balance? One of the first few apps to be downloaded on any new smartphone is the phone banking app. Another application of how apps help the financial markets can be seen by the case is stock brokers. They are always on the phone, checking latest stock prices and transacting and doing business on the phone. Financial services can be complex, so mobile experiences need to be genuinely customer-centric. As a financial service provider, there is a plethora of information that is available and it becomes necessary for seamless transmittal of information into digital platforms so that the same can be utilised. Firms should choose mobile charting as an effective way of conveying useful information to the users of the apps. It has been predicted that by 2019, approximately 2 billion people will use mobile banking and the users will be able to use apps to track, transact and spend from their apps. Apart from just attracting customers with the ease with which the apps work, the exposure to these apps also attracts prospective employees. All employees want to work with an employer who is represented by cutting edge technology and attractive apps. 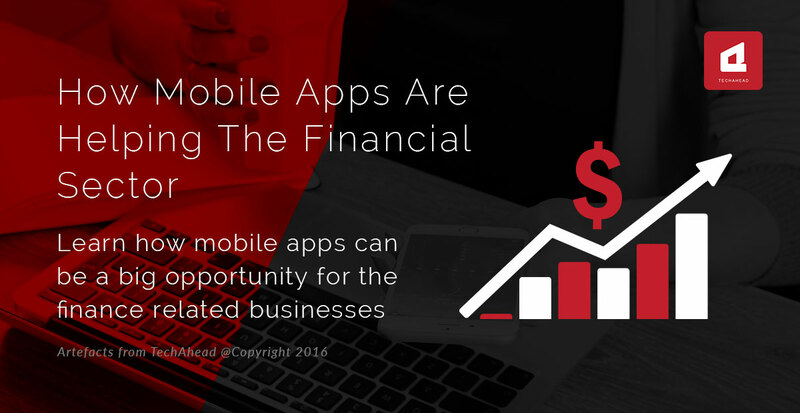 Mobile Apps also ensure that the financial sector enterprise has maximum business. By making the business more accessible, mobile apps have ensured that the business captures maximum market share and increases sales. By providing safe and secure transactions, mobile apps have strengthened the bond between existing customers and the business as well. This ensures continued patronage and work. Mobile applications from finance organizations can supply underserved clients with means to manage and leverage investment or business opportunities. The use of mobile apps has also ensured that the operational cost of running the business has been reduced. Mobile apps provide one-stop shops for buying, returning, acquiring, exchanging, and remitting of goods and services. Apart from this, mobile apps have also ensured that there is a seamless, virtual transfer of data from customer to management and vice versa. Mobile apps have made space for virtual customer help stations and have reduced costs further. This is a very popular app. This app is for Android users and has the following features. • The app specialised in payments. These payments are verified and secure. What is your opinion on the topic? Do you think mobile apps are becoming a necessity for Financial sector? Let us know in comments below. Financial services can be complex, so mobile experiences need to be genuinely customer-centric. There are many aspects to how mobile apps are helping the financial sector. We address them one by one in this article.